Chaplain services are widely available in inpatient medical settings, yet chaplaincy services are not commonly incorporated into outpatient settings. The article for this webinar reports the results of distress screenings and spiritual care interventions in an outpatient oncology setting using retrospective analysis. Selecting religious/spiritual concerns such as isolation, fear of death, and doubts about faith from a list of options on a tablet device, patients? self-reports informed decisions about which patients were offered spiritual care interventions by telephone. 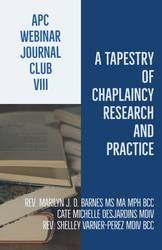 Of particular interest are the intersection of spiritual and mental health concerns in patients with acute disease, as well the novel chaplaincy care intervention of tele-chaplaincy. To describe the prevalence and correlates of patient-reported religious/spiritual needs in an outpatient oncology setting. To explore patient response to a chaplain intervention by telephone. Reading: Forthcoming. Petra J. Wahnefried, Kendall Walsh, Danielle M. Boselli, and Patrick Meadors. "Using Patient-Reported Religious/Spiritual Concerns to Identify Patients who Accept Chaplain Interventions in an Outpatient Oncology Setting". Cate Michelle Desjardins MDiv is a chaplain fellow at Cincinnati Children's Hospital Medical Center in Cincinnati, OH and Transforming Chaplain Fellow. She is completing her MPH degree at University of Cincinnati College of Medicine. Her research is focused on pediatric complex care, medical decision making, and religious coping.